Do You have what it takes to beat the best teams in the world? Teams of 4 USC undergraduate students register to compete to be selected by a panel of judges as the winning team and will represent USC Marshall at the 2019 Marshall International Case Competition (if you do not have a team, no worries but you do need to act fast- see below on joining the 2019 MICC Challenger Team Neworking FB Page- and see others who also have interest in forming a team). Teams will be provided the case 4 days prior to the competition. Each team will put together and present a 15 minute PowerPoint presentation solution to the case problem. (All team members must present during the presentation. )Example presentations and videos of winning case presentations can be found under Past Competitions. For the preliminary round, teams will be divided randomly into “brackets”. After the preliminary round presentations, a winner will be selected from each room/bracket to present in the finals. From selected teams who present in the finals, a winning team will be named winner, and will represent USC Marshall at the 2019 MICC. The winning team from the MICC Challenger will represent USC Marshall and compete against students from 19 of the best business schools worldwide in the Marshall International Case Competition from February 19-23, 2019. Check out what the MICC is all about on Facebook and see actual video footage of the past presentations. 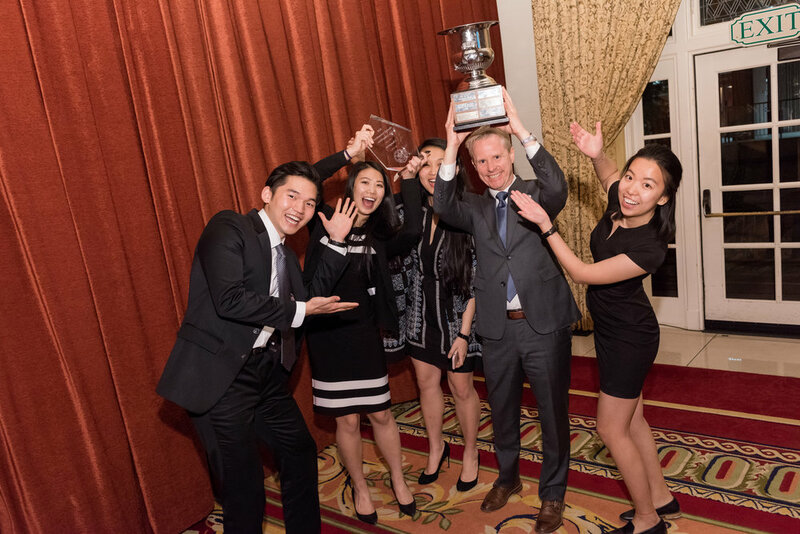 The chosen team will enjoy the MICC events and dinners, be housed at the USC Hotel, and meet incredible students from around the world, and have the chance to compete for the Marshall Cup, one of the oldest and most storied trophies amongst case competition. It’s a one of a kind experience! Oh, and each member of the winning team will receive a $150 gift card from the USC Bookstore.